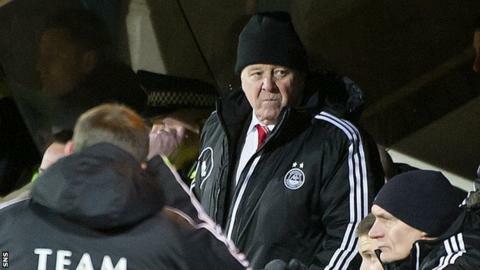 Aberdeen manager Craig Brown was left ruing costly mistakes after his side's defeat at the hands of St Johnstone. Defensive errors allowed the Perth club to claim a 3-1 victory and leapfrog the Dons in the league table. "We started the second half positively, but we were very poor thereafter. We conceded terrible goals," said Brown. "The mistakes we're making are costing us dearly. There's no denying that, defensively, we're giving the softest goals possible away." Brown bemoaned individual errors by his players, including a missed penalty in their previous match against Hibernian. "Missing a penalty at the weekend in a game we dominated," he said. "Then Isaac Osbourne, a very reliable guy, is short with a passback, giving St Johnstone the initiative. "The first goal is very important in games like this, and we can't continue doing that if we hope to get many more points in the league. "We had an opportunity today to consolidate our position in the top group, but we unfortunately failed to take that chance. "That's what's happening to us at the moment. We're not being outplayed by anyone, but we are conceding." Brown insisted that part of the problem was the difference between Aberdeen performances at home and on the road. "We are capable of playing some very good football," he said. "Against Dundee United at home, against St Johnstone at home, we played exceptionally well. "It was a complete contrast, the home fixture, to this one. "We've had a very good record away from home this season, but the last couple of away matches have been extremely disappointing." And the veteran manager considers the lack of two influential figures in central defence as one reason for their downturn in fortunes. "I think the lack of presence of Russell Anderson or Andy Considine is beginning to show," said Brown. Brown was also quick to defend goalkeeper Jamie Langfield. "He did make a very fine save in the first-half to keep us in the game," said Brown. "And he had no chance with their opening goal. "There's a tightening-up all round required."